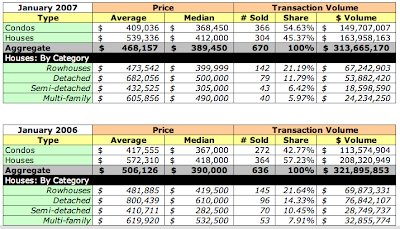 As I mentioned earlier, I've finished collecting and scrubbing [correcting] full value residential sales the District recorded in January 2007; the data have been uploaded to DCHomePrices.com and DCCondoPrices.com. I had to omit a few sales, probably less than 5, because of irreparably bad data [read: poor quality assurance], e.g., the $88MM condo in Q14. I changed the formatting of my analysis and added a new metric - dollar volume - to provide greater insight into the market's current state. I think it's more informative now. In January 2007, 670 residential sales were recorded by the District. The majority of sales, 54.63%, were condos. However, given their lower average prices as compared to houses, the condo dollar volume was 47.73% of the total dollar volume of $313.7MM. Compared to January 2006, prices and dollar volume are down while the number of units sold has increased; I suspect this can be explained in the shift to greater numbers of condos sold vice houses. A number of new condo buildings are coming online now, too. I'm curious to measure their impact on the market's prices, i.e., where would prices be without the new condos. 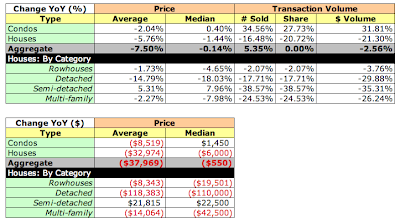 Of particular interest is that although the number of condos sold increased by almost 35% YoY, average and median prices for condos were negative or flat. In the aggregate, average and median prices were negative or flat and dollar volume declined despite a 5.35% increase in units sold.